Problem: Describe an algorithm that you could use if programming an elevator. Solution: No custom elevator knowledge is assumed here. 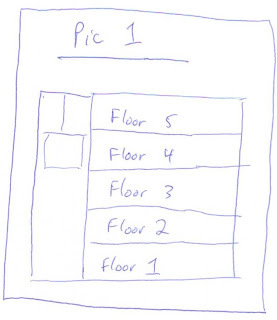 Let’s start by drawing a picture to allow us to make sure that we understand the problem. 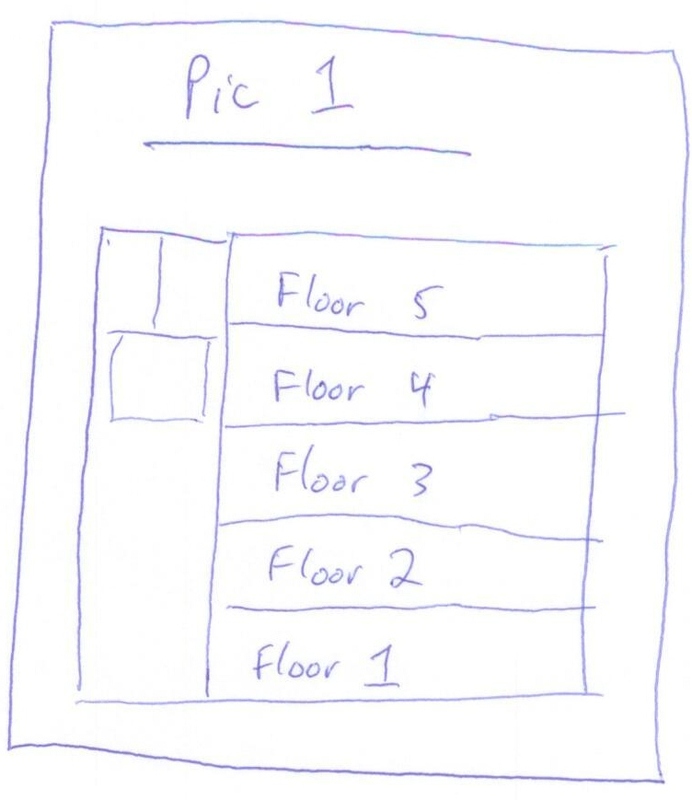 Pic 1 is a simple picture of an elevator and some floors it can stop on. When someone is in the elevator, it is going up or down. These are the basics. Now, let’s try an example. Assume that someone walks into a building and presses the up button on the bottom floor – what happens? Well, assuming no one is in the elevator, it will come down from the floor it is on. So, the person will have to wait while the elevator comes down. This example highlights another issue. Where does the elevator wait when it is not in use? One first thought would be to wait in the middle. This would seem to optimize between people going up and people going down. We can probably assume too that there are relatively few trips between floors – though even this may not be true if for example a company has offices on more than one floor. But, let’s keep it simple. But, think about someone coming in to go up. When do people do this? And, when do people go down primarily? This would depend a little on the type of building. In an office building, people will often come in in the morning and leave in the evening. In an apartment building, it would be the opposite. One optimization could be to move the elevator closer to where people are expected at different times of day. This could reduce wait times dramatically. 1 When someone is in the elevator, it is going up or down. The elevator will wait at the bottom floor when not in use between 7am-10am. The elevator will wait at the top floor when not in use between 3pm – 7pm. Well, we have a good algorithm here. Most important in this problem, is to 1) not ignore the obvious such as the rules of how an elevator works and what it is trying to optimize, and 2) always seek to ‘stretch’ your answer. In this case, we stretched with an optimization problem. From my friend Steve: Should I assume the floors are in order? The floors numbers in US buildings look like alphabet soup. The newest technology has users punch in their floor number in the lobby and the cabs have no buttons. Also, how many local and express cabs are in the bank, and are we optimizing for dispatch time or trip time? Are there up peak and down peak periods? Do we trigger those periods by car load factor or clock?